My family is going on the Navigator of the Seas in March 2020. Last boat we were on was the Allure of the Seas which we had an excellent time. We liked Sorrentos and being able to grab a piece of pizza. Does Navigator have a pizza place like Sorrentos after dry dock? Does anyone have pricing of the Drybar and have any reviews on the experience? I just downloaded the Holland America Navigator App but it will not let me log in with my HAL Credentials. This leaves me with a few questions: 1. Did I download a scam? 2. What is the app? 3. What do I do with the app. 4. Anything else you can tell me. Can anyone please tell me in which specialty restaurant Pinnacles eat breakfast on NV? So this is the first time we are taking the kids on a cruise. Question is for the MDR, is there a kids menu? If so, what does that look like. Anybody have a sample of one? Is is the same thing every night? Second question for breakfast. Does Johnny Rockets offer a free breakfast on the Navigator? I just booked a cruise on navigator of the sea and read the reviews which seem not at the best. Have the reviews gotten any better since the revamp of the shop and it’s fullu operational now? While @EmilyJay did a great job posting about the overall cruise experience on the March 1, 2019 nine night sailing to the ABC islands, I thought I'd focus on the ship, updates and various venues and public spaces. 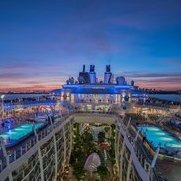 Check out EmilyJay's live trip report here: https://boards.cruisecritic.com/topic/2639274-live-review-navigator-of-the-seas-abc-islands-1st-10th-march/ The updates have been quite extensive, more so than some of the previous 'Royal Amplified' ships. In 2018 I sailed a few of the Voyager class ships including Adventure, Explorer, Mariner and I last sailed Navigator just before her dry dock and amplification. Voyager class ships are sweet spot for me and after sailing the 'new' Navigator for this March 1, 2019 sailing, I've grown to really enjoy the updates. I’ve snapped pics of any menus I could find at various restaurants so I’ll post those too. If you are going to reply to any comments please do not include the pictures in your reply. Thanks. I realize that "healthy" means different things to different people, but I needed a short title! I prefer meats and seafood that aren't fried or greasy, whole grains, and lots of veggies (like them best with no butter). Eating out is usually a compromise, and that's fine, but if anyone has any tips for finding this type of food on the Navigator (besides the salad), I'd appreciate hearing them. For example, I did a Carnival cruise and they had really good grilled salmon available every night in the MDR. I'm thrilled to be cruising Royal again -- just need a little help finding my favorite foods without being a princess about it! On a 4 day cruise do Diamond Plus Members still have 3 coupons loaded onto their sea pass card to use in different bars after 4:30 p.m. Where is lounge located and is there another room for overflow? Currently on navigator and have been delayed due to medical emergency. Just off the Navigator. Just to confirm for everyone. DL is now on deck 5. Very small with a couple of small windows. During the day it was busy, but you could get a seat. Continental breakfast served, plus appetizers during cocktail hour 4:30 p.m. to 8:00 p.m. Cocktail hour was packed. Very small bar set up - hard for staff to negotiate. An overflow lounge was set up in the nearby Star Lounge complete with appetizers. Waiters were roving in there and very attentive. You our need to use Seapass card to enter diamond lounge, but no one checking Star Lounge; just a private party sign. No access for diamond plus in the new concierge/suite lounge, which is in the old diamond lounge location on deck 13 (think it’s 13). Just back yesterday from a wonderful cruise on the recently refurbished NAVIGATOR OTS. This was a 5-day charter (adult only) to Jamaica and Nassau. It's been several years since I've sailed on a Voyager Class and I forgot how much I love this class of ship. In many ways better than the Oasis Class. Royal did a phenomenal job with the refurbishment and it's almost like a new ship. The new pool deck is superb, perhaps my favorite pool deck of any ship afloat now. It's bright, cheerful, colorful, and perfect for the Caribbean. Tons of seating options from chairs, to loungers, hammocks, and even cabanas. Even the pools have a built in ledge around them so you can sit in mid-chest high water if you want without totally going in. The slides and flowrider are tons of fun, and I rode both slides multiple times. One slide uses a mat, and the other an inflatable raft that holds two people (400 lbs max). The raft slide was closed the first two days but they finally got it working. Both slides are well worth while. Food and service were great, and the new Windjammer is awesome. Way better than the Oasis Class I think and beautifully done. This being a charter it was open sitting for the entire ship for dinner each night in the dining room. It worked like a charm. We had a party of ten and never had to wait more than 5 minutes for a table (around 8pm or 8:30pm usually). All the wait staff I encountered were awesome and that goes for the bartenders and my cabin steward as well. I was in cabin 7532 which was a large balcony cabin. It had brand new carpet, a new sofa, new bedding, new drapes, and I think a new TV (which was interactive). The cabin seemed really big. Much larger than I remember. The sofa was so big (long) but no more coffee table. The balcony had nice furniture (two chairs and a table) which I think were new as well. The bathroom is untouched and original. My favorite new bar on the ship is the Bamboo Lounge and that is where I spent most evenings. It has a great atmosphere with a wonderful bar staff and atmosphere. The R-Bar was my second favorite and Royal did a nice job refreshing this space. There were two production shows which were pretty good (one all new), plus the ice skating show that was amazing. Drones were used in the show and it was quite dramatic. I think my favorite ice skating show of all my Royal cruises. There was also a Journey tribute show which I loved. Really brought me back to my high school days! This being a charter not all Diamond level benefits were available. For instance they did not offer the unlimited happy hour drinks in the Diamond Lounge each evening, but they did load the 3 free drinks into your Seapass card to use at any bar from 4-8pm. I found that some bartenders didn't ring it up so you really could get more than the 3 drinks depending on which bar you went to. The Diamond Lounge itself was quite nice, and open daily with its own mini-buffet and coffee/tea. It was moved from the Viking Crown to the old Connoisseur Cigar Lounge. So the view is not as great but it's still a very nice space. Two negatives ... one very minor and one not as minor. First the CD. Sorry but I found him beyond annoying. Just too Vegas cheesy for me. Not a big deal as the CD doesn't really impact my cruise, but this guy seemed to be much more in my face ... probably because I found him annoying! LOL. Second was the only aspect of the refit I did not like. Lots of new cabins were added to where the spa used to be. Gone are the wonderful mens/womens steam and sauna with the great views of the ocean. All cabins now. Also gone is the forward facing fitness center with great views. It's all cabins now as well. The size of the spa was greatly reduced and now occupies just a small interior area that is in the center of where all these cabins were added. It's disappointing especially because the Voyager Class had one of the nicest spas and fitness centers afloat. The fitness center was actually moved aft, to an area on the port side of the ship. It will still have views but not those great forward facing views. Unfortunately the fitness center was closed this entire cruise. We found out from staff that the ceiling is actually too low. If you stand on a treadmill you can hit your head. So they have to actually cut holes in the drop ceiling above the treadmills to make them usable. I was quite disappointed there was no fitness center on this cruise. They did put some treadmills in the solarium as a temporary solution but it's hot in there plus just an odd place to work out. I passed. So overall a fantastic trip on a really wonderful ship, and Royal should be proud of the job they did with NAVIGATOR's refit. It's truly awesome, enough so I plan to return in the fall when CocoCay is finished so I can experience that as well. I did take some pics and I'll post a link when I get them uploaded. i just booked the 9 night southern Caribbean cruise for March 12, 2019. This will be my first time on navigator and to the abc islands. I am very excited. I was looking to see when she will be going into drydock. I looked through the threads and keep getting different answers. Someone said January 2019. For 47 days. Another site said 2018 with oasis features. Whatever that means. Does anybody know? Also I'm booked in September of this year for oasis. And some post said oasis is due this year. Can't seem to find anything. A friend mentioned that the sauna and steam room on Navigator were removed during dry dock. Anyone have information on this? Can anyone tell me who the current Loyalty Ambassador is on the Navigator . . . In April 2019? Thank you. Hi everyone, we are so excited for our upcoming 9 night cruise on Navigator next month! I've been reading a lot of mixed reviews about the fitness center since dry dock. Does anyone who recently sailed know if the fitness center is open in the aft of the ship? Does it have free weights, weight machines and cardio machines? Thanks! I was thinking about booking the new junior suites on deck 11. I noticed that the balcony is 567 sq. Ft is this a typo? Also it says the room is 235 sq ft. Which seems incredibly small for a js? We really enjoyed the Navigator app HAL now offers. Very efficient, easy to use and didn't need all the paper. A quick story about booking an excursion on the app; We had a change to the itinerary due to weather. Of course, the logistics for HAL to get excursions arranged caused a bit of a stir with the passengers. We checked the app several times and sure enough, the new excursions were posted before EXC were open for walk-up reservations. We booked via the app and voila! No waiting in line. We also used for daily menus, happing on board, account statements etc. Very nice app. Hi. I am booked on Navigator OTS in Cabin 1886. This looks to be a connecting cabin. My question - where is the connecting door in the cabin? I am guessing that the bed in this cabin is near the balcony - is that correct? and that the connecting door would be closer to the bathroom. Is the connecting door in place of a sofa ? or on the opposite side? thanks for any input. Are there USB outlets in the Oceanview Balcony Cabins? Does anyone know - after the extensive refurb that Navigator received - were all cabins given a refresh or just certain groups? I read on the HAL website that this 'mobile friendly tool' also provides the option to chat with fellow travelers. Does anyone know if this would be similar to texting, but in airplane mode? And there are no charges for using this on your phone.